UPDATE: 1:36 AM — 8 lbs. 14 oz. and all is well! Daughter-in-law Anna gave birth to Elizabeth Arabella Rose Ray tonight! That will make Number 8, and the third grand-daughter. 2) Same topic as #1. This time on Relevant Radio with Chuck Neff’s Searching the Word from 1:00-2:00 Eastern time. 3) The “Death of St. Paul” to close put the Year of St. Paul on The Catholic Guy Show with Lino Rulli on Sirius Satellite at 5:00 PM Eastern time. I am also pre-recording to other shows tomorrow. 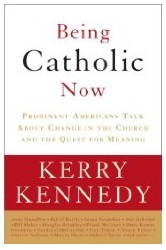 Kerry Kennedy, daughter of Senator Robert Kennedy, recently published a book of essays by leading American “Catholics” on their experience as Catholics over the last few decades. Many of them are liberal “Catholics” with an obvious lack of Catholic formation. However there are others like Tom Monaghan. The title of the book is Being Catholic Now published by Crown. Dr. Francis Beckwith, new revert to the Catholic Church, has written a very excellent review of the book which was just published in the June 2009 issue of the Catholic World Report. It is well worth reading. It will help you understand the problem we have with liberal Catholic politicians and those who have caved in to the tyranny of relativism yet still want to call themselves Catholic. You can find the article here.